Give your kids a powerhouse snack this school year with these Protein Boost Granola Bars which pack in more nutrition than a multivitamin! 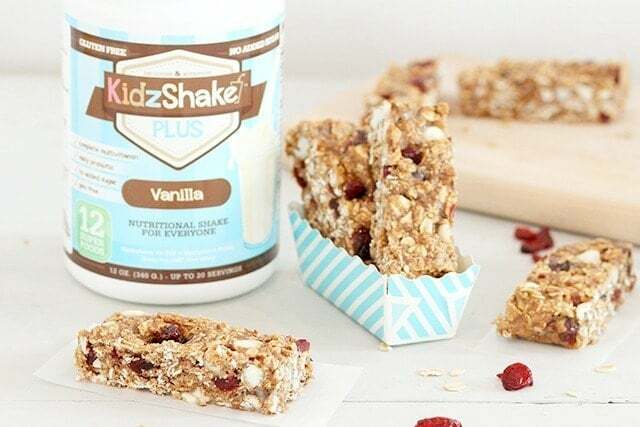 We loved partnering with KidzShake to create these granola bars for you. 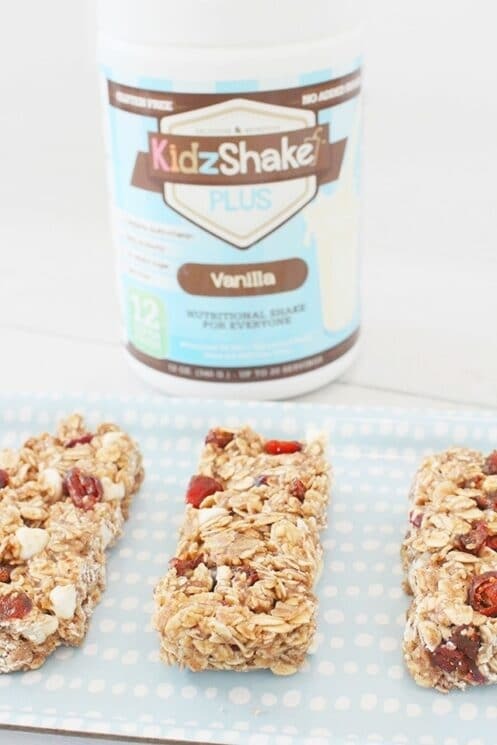 When people ask us which protein powder we recommend for kids, our #1 go-to is Kidzshake. Keep reading to find out why. We get questions every single week about protein powder for kids. I understand why! Protein is important for healthy growth and development for active kids. Most of the time, people want to know which protein powder we recommend. But first let’s take a step back and determine if it’s something your kids need in the first place. …refuses protein-rich foods because of texture aversions or selective eating. …has a characteristically small appetite, or tends to eat mostly grains. …has a history of slow growth or failure to grow. …is sick often, suffering from cold and flu symptoms that take a long time to clear up. …has hair that looks thin or dull, or nails that crack and peel easily. …has cuts and scrapes that seem to heal more slowly than they should. …then try extra protein! In many of these cases, a powder can help. A powder with only a few ingredients and additives. No added sugars or artificial sweeteners. No ‘energy-boosting” ingredients, which often means a powder contains caffeine. Plenty of protein per serving. It tastes really yummy and has a smooth texture, so kids will actually eat it. It’s free of rBGH, GMO, artificial color and flavor, and BHT/BHA. It’s free of gluten, soy, and nuts. It includes a daily multivitamin, and a probiotic. If your child is lacking nutrition and really just needs a boost to get back on track, this is the protein powder that provides all the essential amino acids without any of the additives you don’t want in their bodies. Smoothies and shakes are great, but sometimes kids don’t feel like drinking their protein. It’s nice to have a solid food recipe to mix things up! 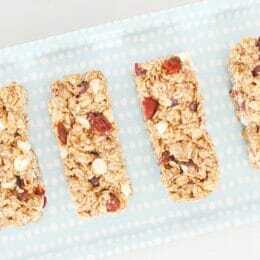 Protein granola bars are sweet and satisfying and filled with SO many powerhouse ingredients. 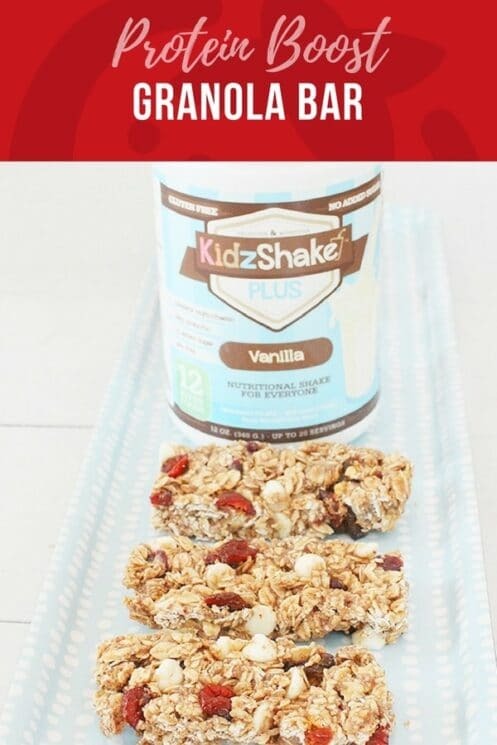 In this recipe, I’ve included oats, Kidzshake protein powder, ground flaxseed, almond butter, and dried cranberries. These ingredients contribute to your child’s protein AND fiber intake. In each granola bar your kids are getting those essential macronutrients along with needed vitamins, minerals and probiotics. Plus they taste amazing! If your kids don’t like the white chocolate chips, feel free to substitute them for dark chocolate. You can also swap out the dried cranberries for other dried fruit like apple, mango, or apricot. Mix it up! Preheat oven to 350° F. Grease an 8×8-inch baking dish. In a large mixing bowl, combine oats, protein powder, flaxseed, cinnamon, and salt. In a small bowl, whisk together the almond butter, honey, almond milk, and vanilla. Add to dry ingredients along with cranberries and white chocolate chips; mix thoroughly. If it becomes too sticky just mix with your hands! Press into prepared baking dish and bake for 15-20 minutes; watch closely the last 5 minutes to ensure the bars don’t become too brown. Kids and adult loved these! 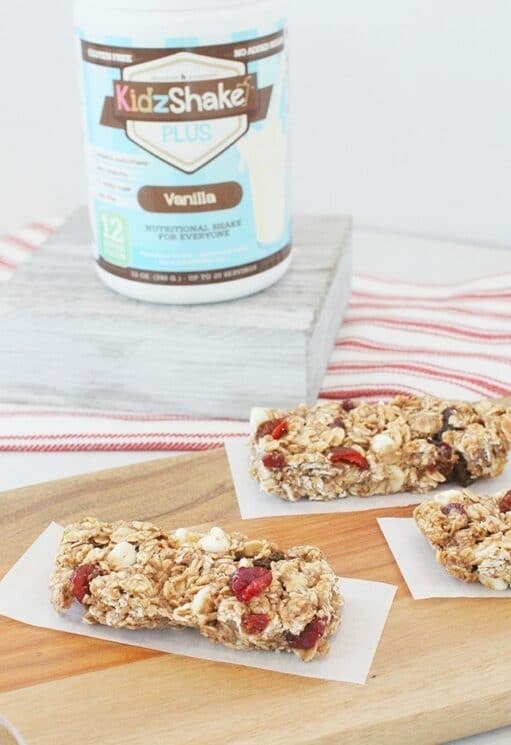 Easy to make and just the right protein carb mix I was looking for. I will use these for pre and post little athletes. I only added a few bits of dark chocolate. Hi, I noticed you mentioned the kids shake is soy free but then above it talks about soy protein. Was that just an example of what to look for in other shakes? Yes! We just wanted to share the different types of proteins for educational purposes! Great recipe and thank you for advising about protein portions for kids based on age.